You can recreate a Texas tradition in your own kitchen with chef Ryan Farr's version of the famous Texas hot links. This recipe appears in his home-butchering handbook/cookbook, Whole Beast Butchery, provided here with permission from Chronicle Books. Farr describes his hot links as "really rich with a beautiful, full flavor and a lot of heat." 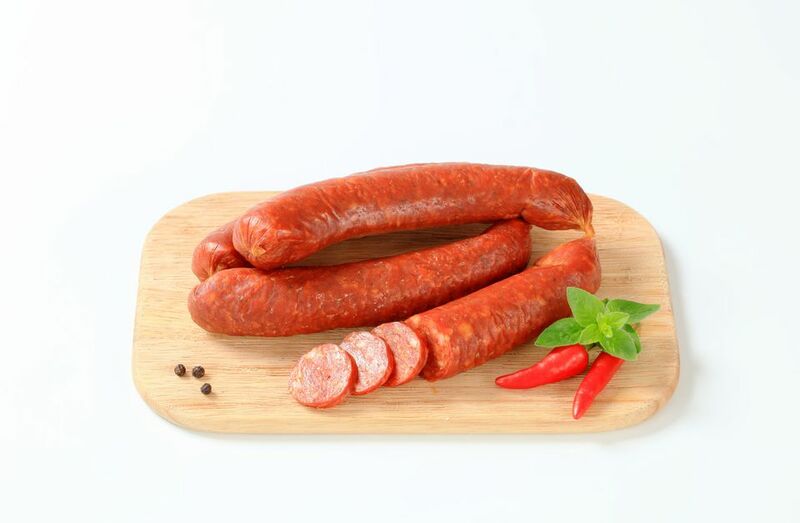 The sausages should be hot-smoked until cooked through to an internal temperature of 148 F. But if you don't have the equipment necessary for smoking, they also taste great poached or gently grilled, he says. You need about 20 feet of large or medium hog casings for this recipe, which you can order online or purchase from a specialty butcher. The night before: Soak the hog casings in a bowl of cold water; refrigerate overnight. The next day: Untangle the casings and begin to open them to make the stuffing process easier. Hold one end of each piece of casing up to the nozzle of the faucet and support it with your other hand. Gently turn on the water and let it run through the casings to check for holes. If there are any holes in the casings, cut out the pieces with the holes. Hold the casings in a bowl of ice water or refrigerate until stuffing time. Cut the beef into 1-inch cubes or a size slightly smaller than the opening of the meat grinder. Open-freeze the meat again, uncovered, for 30 to 60 minutes, until the surface of the meat is crunchy to the touch and the interior is very cold, but not frozen. When you are ready to grind, prepare a perfectly clean and chilled meat grinder for grinding, and fit it with the medium plate. Start the auger and, without using the supplied pusher, let the auger gently grab each cube of meat and bring it forward toward the blade and through the grinding plate. Continue grinding until all of the meat has been processed. Place it in a clean, cold non-reactive bowl or tub and again open-freeze, uncovered, for 30 to 60 minutes, until the surface is crunchy to the touch and the interior is very cold, but not frozen. In a medium nonreactive bowl, combine the dry ingredients with the ice water and yellow mustard and whisk together until completely blended and the dry ingredients have dissolved (the “slurry”). In a large, wide basin or bowl that will give you plenty of room to mix the meat and seasonings, combine the cold meat with the slurry. Roll up your sleeves and with perfectly clean hands, begin kneading and turning the mixture as you would a large quantity of bread dough. Eventually, you will begin to notice that the mixture has acquired a somewhat creamy texture. This is caused by the warmth of your hands and is a sign that you have finished mixing. Spoon out a few tablespoons of the mixture, and return the remainder to the refrigerator. In a nonstick skillet over medium heat, lightly fry a test portion of sausage mixture until cooked through but not caramelized (which would change the flavor profile). Taste for seasoning. Based on this taste test, you can adjust the salt in the main portion of sausage, if desired. Prepare a perfectly clean and chilled sausage stuffer and place the water-filled bowl of casings next to it. You will also need a landing surface of clean trays or parchment paper-lined baking sheets for your finished sausages. Load the sausage mixture into the canister of the sausage stuffer, compacting it very lightly with a spatula to be sure there are no air pockets. Replace the lid. Thread a length of casing all the way onto the stuffing horn and start cranking just enough to move a little of the ground meat mixture into the casing. As soon as you can see the meat poking through the nose of the stuffer, stop and crank backward slightly to halt the forward movement. Pinch the casing where the meat starts (to extrude all the air), and tie into a knot. Now start cranking again with one hand while you support the emerging sausage with the other. Move the casing out slowly to allow it to fill fully but not too tightly so that there will be some give in the sausage when it comes time to tie the links. When you get close to the end, leave 6 inches of unstuffed casing and stop cranking. Go back to the original knot and measure 6 inches of sausage. Pinch the sausage gently to form your first link, and twist forward for about seven rotations. Move another 6 inches down the sausage, and this time, pinch firmly and twist backward. Repeat this process every 6 inches, alternating forward and backward, until you reach the open end of the casing. Twist the open end right at the last bit of sausage to seal off the whole coil, and then tie a knot. Ideally, hang the sausage overnight in a refrigerator, or refrigerate on parchment paper-lined baking sheets covered with plastic wrap, to allow the casing to form fully to the meat, and the sausage to settle. (Or, if desired, you can cook the sausages by smoking slow-and-low right away.) The next day, cut between each link and cook as desired.